Five possible routes for a tunnel between Sheffield and Manchester have been unveiled. The Department for Transport (DfT) said the tunnel, which would bore through the Peak District, could halve journey times between the two cities. It described the scheme as "the most ambitious road scheme undertaken in the UK in more than five decades". The Campaign for Better Transport described the scheme as a "folly" and claimed it would increase pollution. Bridget Fox, from the group, said: "The enormous sums of money and expertise being spent on this speculative exercise would be better used on proven solutions and improving everyday travel." The plans would link the M60 motorway east of Manchester to the M1 north of Sheffield. 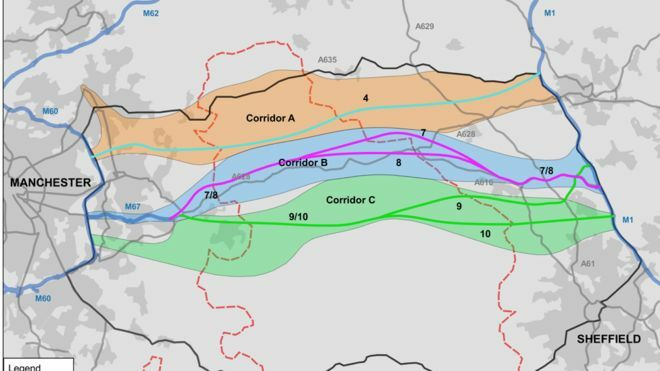 A feasibility report published last year by Highways England said the project would include a tunnelled section, which could range between 20-30km (12 -19 miles), making it one of the longest road tunnels ever built. The DfT said the tunnel "could provide an economic boost to the two cities as well as the surrounding area, as well as reducing traffic through the Peak District National Park". Transport Minister John Hayes said: "I want people in the north of England to benefit from quicker, more reliable journeys. "Today's study brings us a step closer to building a Trans-Pennine roads tunnel - it would be the most ambitious project since the construction of the first motorways 50 years ago." A DfT spokesman said that no timeframe for building the tunnel had been decided, nor had the cost or sources of funding been identified. A final report on the economic benefits of each route is expected by the end of the year.